Flying across the south Pacific is no trivial matter, and yet, flying time in 10-hour chunks is about as routine as … well … flying from Santiago, Chile to one of Los Angeles, Dallas, or Miami. The countless trips between North America and Chile over the years has meant that a 10-hour flight becomes one of routine. LAN Airlines‘ “south Pacific ferry” goes Santiago (SCL) – Auckland (AKL) – Sydney (SYD). Auckland is an important junction with additional destinations in New Zealand, Australia, Oceania, and continental Asia. LAN uses Airbus 340-300 series metal on their transpacific and transatlantic routes with 2-4-2 economy configuration. The flight leaves SCL just after 11pm, and arrives in AKL at about 4am local time for a flight duration of just over 13 hours. 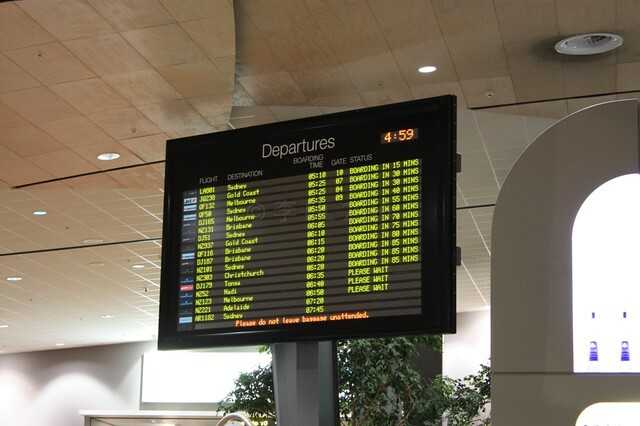 As I’m going through to SYD, I alight the plane in AKL, follow the signs to the international-transfer area, clear the X-ray machines, head on into the just-open international terminal, and get ready to board the same plane. Some of the available choices open in the early hour include duty-free shops, coffee and fast-food outlets, Whitcoulls (books), and The Great New Zealand Shop. 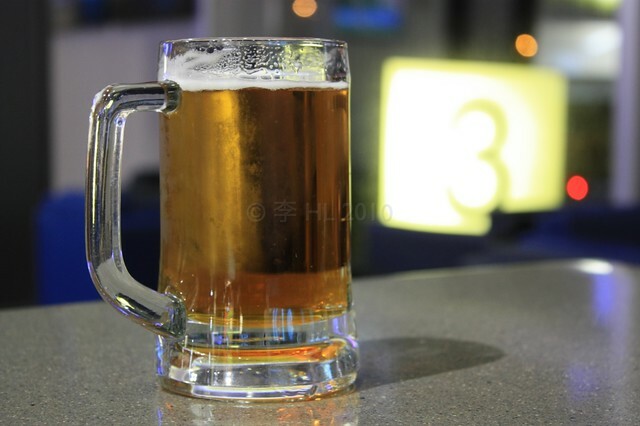 Even though the clock and departure board both show 5am, I head straight to Blue Bar. … to quaff this beautiful beverage. It’s about 1pm in Chile, and I’m ready for that “lunch beer”, despite the apparent incongruity of breakfast in the rest of the terminal. It isn’t cheap, but the beer is delicious, refreshing. In making this trip over the south Pacific a fourth time, I’ve learned the 5am beer at AKL is an essential rite of sustenance to propel me over the Tasman Sea. With the departure from AKL at 6am, the final flight-segment lasts 3.5 hours, which is enough time for the post-beer breakfast and the post-brekkie snooze, before the plane lands in SYD at 730am local time. I made the photos above on 23 September 2010 in Auckland airport. This post appeared originally on Posterous, then moved and edited on Fotoeins Fotopress as fotoeins.com at http://wp.me/p1BIdT-1z.